When the Spanish Conquistadors first encountered the Incas, they were amazed by many things. Click here to play! For one, the extent of the Inca society was incredible considering the technologies they used, and achievements such as the temple ziggurats could not have failed to impress even the most jaded explorers. What really caught the eye, though, was all of the Inca gold. 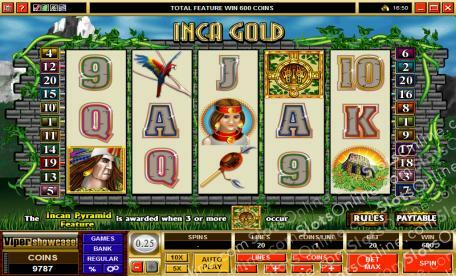 In the Inca Gold slots, you'll be after the gold for yourself. By lining up ancient temples, macaws, Inca instruments, Inca princesses or the Inca Priest symbols, you can win yourself a fortune like that held by the Inca Empire. Play the Inca Gold slots now to step back in time to when an ancient and complex empire controlled vast swathes of South America and held enough gold to sink a small continent. The Scattered Amulet symbol is the scatter symbol in this game. It pays out on the total bet when enough symbols are scattered on the slots. Scatter symbols payout at equal to the total bet when 2 symbols land on the reels, 4 times the bet with 3 symbols, 20 times the bet with 4 symbols, and 100 times the bet with 5 symbols. The Inca Priest symbol is wild and substitutes for any symbol other than scatter symbols. 3 or more scatter symbols trigger the Inca Pyramid Bonus Game. In this game, players win 5 free spins at a double prize multiplier, as well as the chance to win additional random bonus amounts. These are awarded when the player chooses correctly from the blocks of an Inca Pyramid. There are 10 blocks on different levels. As the player chooses blocks that reveal prizes, the level increases until reaching the final level where a multiplier of up to 150 times the bet amount can be awarded.